This review wasn't able to be submitted as it was stolen by a guard dog. I swear, it really happened. Joe Hunter is back in the game and ready to be bashed and shot, and possibly paid. This time Joe is hired to protect a young boy whose mother has just been killed during a home invasion. But the boy's father knows there is more to the death than that - hint: revenge, it's always revenge - and Joe suspects so as well. Of course, Joe decides to dig into what is really going on, even if his police friend Bryony would prefer he wouldn't. In the interests of full disclosure, I received a copy of this book from the author in exchange for a honest review. You know it will be an honest review because it was only a book and not accompanied with whiskey. 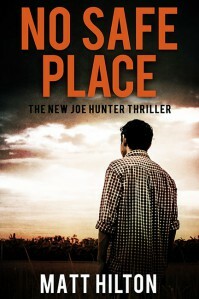 No Safe Place is Matt Hilton's eleventh Joe Hunter novel and it did not disappoint. I've been a long time fan of the Joe Hunter series, and of Matt's other works. His writing is well paced, packed with vivid fight scenes, and has compelling plots. This instalment particularly interested me because I noted that there was more of the Northern England language flavourings to the writing than I'd previously noticed. This could be because after ten novels in a series editors concede you are allowed to write whatever the hell you want. They can't make all of their writers sound like they come from the same place forever. Looking back through my reviews for the rest of the series I note that I frequently used the term "gritty thriller" and rated them 4 stars. Not much has changed. This is another very reliable, entertaining, crime thriller; add it to your To Be Read pile.